Distribution. The tobacco and tomato hornworms are very similar in appearance, biology, and distribution. However, the tobacco hornworm, Manduca sexta (Linnaeus), is more common in the southern United States, especially the Gulf Coast states. Its range extends northward to New York, and even sometimes into southern Ontario. The tomato horn-worm, Manduca quinquemaculata (Haworth), in contrast, is uncommon along the Gulf Coast, but relative to tobacco hornworm it is more likely to be encountered in northern states and southern Canada. These are native species, occurring from the Atlantic to the Pacific Oceans, though for tobacco hornworm the range extends south into Central and South America, and the Caribbean. Host Plants. These insects feed only on solanac-eous plants, particularly tomato and tobacco. They are recorded from other vegetables such as eggplant, pepper, and potato, but such feeding is unusual. Several solanaceous weeds are reported to serve as hosts, including groundcherry, Physalis spp. ; horsenettle, Solanum carolinense; jimsonweed, Datura stramonium; and nightshade, Solanum spp. ; but wild hosts are unimportant larval food sources relative to crops. Adults imbibe nectar from flowers of several plants such as catalpa, Catalpa speciosa; daylily, Hemerocallis sp. ; hollyhock, Althaea rosea; jimsonweed; four o'clock, Mirabilis jalapa; mallow, Hibiscus lasiocarpus; mimosa, Albissia julibrissin; and tobacco. Natural Enemies. Many natural enemies are known from tobacco and tomato hornworm. Lawson (1959) provided a good summary of their importance in North Carolina. Natural enemies of the egg stage include Trichogramma sp. (Hymenoptera: Trichogram-matidae) and Telenomus sp. (Hymenoptera: Scelioni-dae), but these are thought to be of little importance. Of greater importance is the stilt bug Jalysus spinosus (Say) (Hemiptera: Berytidae) and other general predators such as big-eyed bugs (Hemiptera: Lygaeidae) and lacewings (Neuroptera: Chrysopidae). The larvae often are parasitized by Cotesia congrega-tus (Say) (Hymenoptera: Braconidae), and they sometimes are seen bearing clusters of white pupal cases formed by this wasp, attached to their bodies. In North Carolina, 30-40% of hornworms may be parasitized by this wasp. In contrast to this one species of wasp accounting for most of the parasitism by Hymenop-tera, numerous insects in the order Diptera, particularly the Tachinidae, attack tobacco and tomato hornworms. Records of tachinid parasitism from tomato hornworm include Compsilura concinnata (Mei-gen), Drino incompta (Wulp), D. rhoeo (Walker), Lespesia frenchii (Williston), Winthemia leucanae (Kirkpatrick), and W. quadripustulata (Fabricius). 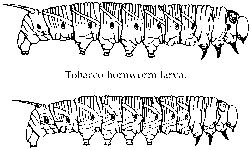 Records of tachi-nids from tobacco hornworm include Carcelia spp., Drino incompta, D. rhoeo, Lespesia spp., Metavoria orientalis Townsend, and Winthemia quadripustulata. In North Carolina, the proportion of hornworm larvae parasitized by tachinids increases during the season, sometimes attaining 100%. The number of tachinid eggs per hornworm larva also increases seasonally, indicating a greater abundance of flies. Also of great significance as a mortality agent of larvae is Polistes spp. (Hymenoptera: Vespidae). These wasps kill and consume, or sometimes carry away to provision their nest, a very high proportion of larvae. Apparently, Polistes spp. is the most important larval mortality factor in North Carolina. Pathogens sometimes affect hornworms. A bacterial disease which causes the larva to blacken and to droop is sometimes reported to kill larvae, but this does not occur regularly, and is observed mostly at very high larval densities. Larvae also are susceptible to infection by the fungus Entomophaga aulicae, but this disease also does not occur widely (Morrow et al., 1987). Vertebrates may prey on the pupae. Skunks and moles are particularly important. Tachinids emerge from the prepupal and pupal stages, but attack only the larvae. Life Cycle and Description. Although these insects are common, they are not serious pests except in home gardens. Thus, there is surprisingly little information about these insects, and particularly about tomato hornworm. The following information applies specifically to tobacco hornworm except where noted, but apparently is equally applicable to tomato hornworm. The number of annual generations ranges from 1 to 2 in Canada to 3-4 in northern Florida, but two generations per year is common over most of the ranges of these species. The proportion of insect that enter diapause increases from about 5% in June to 95% in mid-August, as day length decreases. In northern Florida the insects are active from April to November, but they are abundant only for the first two generations because many pupae enter diapause. In North Carolina they occur from mid-May to October, and evidence of a third generation is poor. Throughout their range, hornworms overwinter in the pupal stage, and in the northernmost parts of their range they may not overwinter successfully, occurring only after dispersal northward during the summer. The life cycle can be completed in 30-50 days, but often is considerably protracted. The eggs are spherical to oval, and measure 1.25-1.50 mm in diameter. 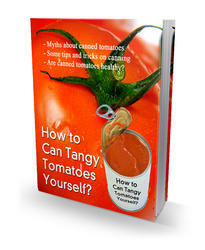 They are smooth and vary in color from light green or yellow when they are early in development, to white at maturity. They are deposited principally on the lower surface of foliage, but also on the upper surface. Mean fecundity was reported by Madden and Chamberlain (1945) to be about 250-350 eggs with seasonal fluctuations and maximum egg production at mid-season. However, Yamamoto (1968) showed that with adequate adult nutrition, fecundity of nearly 1400 eggs per female could be attained. Duration of the egg stage is 2-8 days, but averages five days. 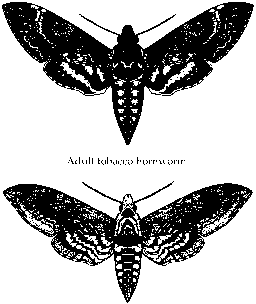 A detailed description of tobacco hornworm biology was given by Madden and Chamberlain (1945), and a more abbreviated but useful description of both species was established by Gilmore (1938). Diapause development was reported by Rabb (1966). Rearing was described by several authors, including Yama-moto (1968, 1969), Stewart and Baker (1970), and Bell and Joachim (1976). Keys to the adults were included in Hodges (1971). final instar, and though the exact value of foliage consumption would differ on tomato, the pattern would be the same. Larvae blend in with the foliage and are not easy to detect. Thus, it is not surprising that they often were not observed until they caused considerable damage at the end of the larval period. Moths are attracted to light and can be captured in light traps. Light traps also were used to attempt suppression of hornworm populations, and though some reduction was noted, this approach did not prove practical (Gentry et al., 1967). Isoamyl salicy-late is attractive to both species of hornworms (Scott and Milam, 1943). Visual examination of foliage usually is recommended for monitoring of larval populations. Young larvae of tobacco hornworm tend to be found in the upper regions of the plant, whereas larvae of tomato hornworm tend to be lower; differential flight and oviposition behavior between the species is implicated (Yamamoto, 1972). Chemical insecticides or Bacillus thuringiensis are applied to the foliage for larval suppression (Creighton et al., 1961). Cultural Practices. The pupae are large and are not buried very deeply in the soil, so greater than 90% mortality is caused by normal soil tillage practices. Hand picking and destruction of larvae is often practical in the home garden. To take advantage of the preference of Polistes wasps for hornworm larvae, wasp shelters or nesting boxes were placed in tobacco fields to encourage the wasps, and wasp colonies were relocated into tobacco (Lawson et al., 1961). Although wasp predation was inadequate to prevent damage to tobacco, this approach might be satisfactory for tomato. Tobacco and tomato hornworms thrive on tobacco plants that are allowed to revegetate after harvest of the leaves, leading to high populations during the next year. Destruction of tobacco stalks, or inhibition of sprouting by application of plant growth regulators, greatly reduces hornworm populations in subsequent seasons (Rabb, 1969). Although not documented, timely destruction of tomato crop residue likely would have similar beneficial effects.